What sacrifices were offered in order to build the railway? Held captive in a tower-block; can she escape? What does his non-existent hand touch? Roadkill … or something worse? What is it like, waiting to become a ghost? Evocations is available via Amazon and other good book dealers. What factors help us to decide to try a new author? Reviews and recommendations from friends help but I have also found that hearing someone speak and enjoying what they say can be a good (albeit not infallible) pointer to a writer worth investigating. James Brogden is a Midlands based writer who was a guest at the Birmingham SF Group in March 2013. Since that appearance he has published two further novels (TOURMALINE and THE REALT, both published by Snow Books) and this short story collection, EVOCATIONS (Alchemy Press). I must confess that I have not read his novels but have enjoyed some of his short stories in previous anthologies. 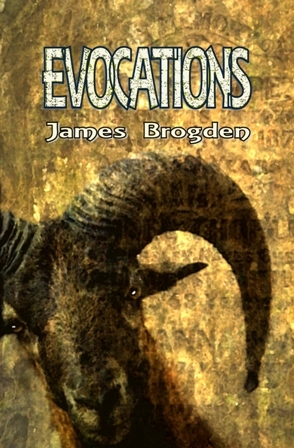 EVOCATIONS is a collection of sixteen of James’ short stories, most previously published elsewhere with a couple of new additions. The stories all contain an element of the fantastical but are also rooted in the real (and mostly modern) world. Some of the stories also verge into horror. Advice often given to budding writers is to write what you know about. Not an easy task if the heart of the story or novel is fantasy or horror. More important, perhaps, is to use places that are familiar. Done well, the result is convincing. James Brogden’s first novel, ‘The Narrows’, was largely set in and around the streets of Birmingham, a place he knows well. It is not surprising then that many of the stories in this volume of ‘Evocations’ have West Midlands settings. ‘The Smith Of Hockley’ sees Wayland the smith working out of the Jewellery Quarter in Birmingham. As the story opens he is watching his wife die because figures from his past want to coerce him into forging a sword for them. He uses their demands as a means of wreaking revenge. Across the City, on the Eastside, a mummified cat was found in the walls of all that remains of Birmingham’s other station. ‘The Curzon Street Horror’ explains the ritual that led to its being there. Meanwhile, the canals that were once the life-blood of the city now harbour sinister denizens. Falling in after dark may lead to the same fate as the reveller in ‘The Gas Street Octopus’. Anyone who knows the M40/M42 junction south of Birmingham at rush hour will have sympathy for the Minister for Transport in ‘The Remover Of Obstacles’. Terry, the victim of circumstance, is given the run-around, chasing his car around the City in search of his car. Birmingham still has its share of tower blocks. In one, a refugee girl’s kindness, despite her dire situation, is rewarded by the pigeon she feeds in ‘The Pigeon Bride.’ To the north of the City lies Sutton Park. The Romans marched through it on the way to York. In ‘If Street’, two boys lie in wait to see the ghosts of the legion passing through. One of the boys disappears with them. There are times when only a few words are needed to provide an unsettling image. Often, it is just taking an idea and following it to extremes. ‘The Phantom Limb’ is one such vignette. It is a well-known phenomenon that an amputated limb can still be felt. What if that phantom limb can actually grip and pull? In this piece, Alex finds out. ‘Junk Male’ is another such gem. As an urban myth, with both participants coming to a sticky end the veracity cannot be known. It nevertheless is a kind of dire warning: don’t mess with your junk mail! ‘The Gas Street Octopus’ is another example of urban myth. These are light horror stories, as is ‘The Decorative Water Feature Of Nameless Dread’ where Brogden is having fun with the format of ‘Gardener’s Question Time’ by having a Lovecraftian monster living in a water feature. He is also adept at writing longer, subtler stories. ‘The Last Dance Of Humphrey Bear’ is a delicate and poignant story of a man who is desperately trying to make amends for the mistakes he made and which led to the death of his daughter. It is also a reminder of the fallibility of protective services when it comes to child abuse and the way manipulative adults erect barriers. In a totally different vein, ‘The Gestalt Princess’ is a steampunk fairy tale. Professor Harcourt made a daughter as a projection, an intelligent hologram. She wanted more and persuaded the Professor’s assistant to help her construct a body.